Introducing ‘My Sage” Portal. Just recently you may have received an email from Sage introducing a new tool that can help you access information regarding new releases, product updates and training opportunities. 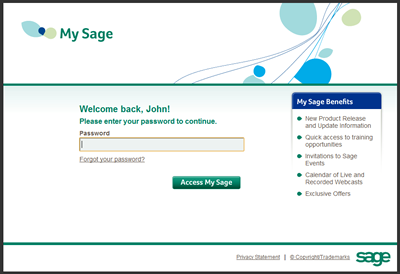 The portal will also feature exclusive special offers on Sage products and upgrade promotions. You will also gain access to the Sage ERP Accpac Community and a listing of all upcoming events. If you have received the email please feel free to log in and your account will be automatically created. If you have not received the email and would like to learn more about this new portal or are having any difficulty logging in, please call 866.436.3530 ext 106 or send an email.